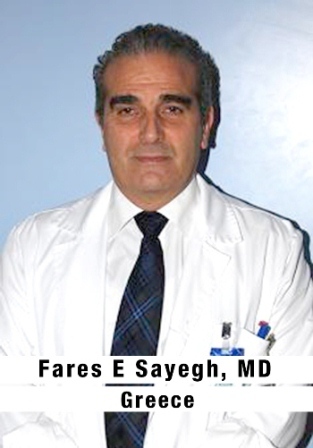 Dr. Fares E. Sayegh was trained in orthopaedic surgery at the University Orthopaedic department of the General Hospital Papanikolaou Thessaloniki, Greece. From 1989 – 1992, he worked as a registrar at different Orthopaedic hospitals in UK. He holds a Ph.D. in Orthopaedics from the Aristotle University of Thessaloniki-Greece, and he currently works as an Associate Professor in Orthopaedics at the 3rd Orthopaedic University department of the Aristotle University of Thessaloniki-Greece. He is actively involved in teaching orthopaedics to medical students at both the undergraduate and graduate levels as well as training of orthopaedic residents at the Aristotle University of Thessaloniki. He is currently the Head of the Emergency Department of the General Hospital Papageorgiou-Thessaloniki, as well as, the elected president of the Orthopaedic and Trauma Association of Northern Greece; Macedonia, and Thrace for the year 2014-2015. His main interest is hip and knee joint replacement surgery, reconstruction joint surgery as well as orthopaedic trauma. He is involved in many university research protocols and has written several articles published in international orthopaedic journals.